Libya was once the Greek name for all of North Africa, bar Egypt. The land we commonly refer to today assumed its title at the behest of Italy’s colonial ventures, the most recent in a millennium’s worth of foreign invaders and conquerors. A distinctly Arab nation – the Roman and Grecian ruins are the few reminders of classical Libya – it lays claim as one of Africa’s first in achieving independence under UN resolution in 1951. The subsequent and short rule of King Idris I was soon disposed of in a bloodless coup lead by the late Col. Gaddafi in 1969. Four decades of increasing state centralisation and authoritarianism followed, directed by Gaddafi’s own peculiar blend of state socialism and Islam. What’s more, increased GDP from oil preceded heightened corruption, whilst the regime’s foreign policy lead to economic sanctions and ostracism from the west. Inevitably, homegrown rebellion and resentment festered under the suffocating regime. Oppression affected the entire spectrum of Libyan society, from atheists to the Muslim Brotherhood. Obscured in this tumultuous pot was Libya’s metal scene. Enter Rex Mortifier, hailing from Benghazi, who daringly produced one demo (Ancient Death, circa 2003) and a very lo-fi split with Brazil’s MetalSatan (self-released, circa 2003). Think the pre-Darkthrone Black Death demos: raw, blackened death recorded on a tape deck. They also appeared on a Legion of Death Records (forever the champion of obscure global metal) compilation Desert Storm of Evil. Their Ancient Path cassette has since resurfaced via Malaysian label Afterlife Productions. Unable to track down Rex Mortifier progenitor, Ghassan ‘Haunted Dead’, Legion of Death mastermind Shaxul was more than willing to cast the spotlight on Libya’s mysterious scene. Indeed, Ghassan exercised a dedication to an underground inconceivable to the western mindset, where the perceived hedonism, and ‘geekery’, of heavy metal was more likely to attract stigmatization, incarceration and even death. It is important to remember that Rex Mortifier, and Ghassan’s apparent disappearance both pre-date Libya’s 2011 war. Defiant against Gaddafi’s Jamahiriya, his passion for metal encompassed a veritable F.O.A.D. attitude and lifestyle, prevailing against all imposed restrictions – not least shoddy equipment. As established in Egypt the libertarian spirit inherent to metal is but a daring feat of counterculture and defiance, where the persistence to follow the ‘left hand path’, as it were, brings nothing short of grave risk. “His band was clearly a catharsis against his country and regime that he totally despised,” continues Shaxul. “I talked to Ghassan a bit before he wanted to go to the south of Libya and join another country, his plan was to go to Europe. He was a deserter; imagine how a guy is treated who doesn’t want to serve in the Libyan army. Before he completely stopped replying to my messages I had a talk with another band member who succeeded to go to England and he confirmed that he was in a bad situation but unfortunately this guy disappeared too. Following the bloody revolution in 2011 toppling Gaddafi’s reign, power vacuums and sectarianism continue the nation’s post-revolution uncertainty. Likewise, the region’s metal remains obfuscated by the tumultuous conflicts and politics. Evidently a generous handful of heavy metal bands operate(d) in Libya, but, naturally it is difficult at best to make contact. Terrorism Or Brutality formed as an escape from the toil and pains of fighting as pro-democracy rebels, death metal the only medium to channel their experiences – a common accolade from the genre’s musicians all too familiar with the frontline. Equally rousing the attention of international media (including Invisible Oranges) were thrash metallers Acacus (http://www.theatlantic.com/magazine/archive/2011/07/libyan-rebels-a-sound-track/308540/) whose vocalist Hazim ‘Haz’ Bozaid is another example of a young man channelling his drive for freedom with death metal in the midst of a revolutionary war. Nestled between Algeria and Libya lies Tunisia, a sun-baked mecca for British holidaymakers hellbent on frazzling themselves purple in the Maghreb sun. Tunisia was also the birthplace of the Arab Spring, where the people decided enough was enough and collectivised against the ruling elite. Considered a regional beacon of post-revolutionary transition, the events of 2011 are worryingly tainted by uncertainty and strife: the new constitution is widely contested and Salafi extremists threaten the secularists. Earlier this year a politician was assassinated in broad daylight, the perpetrators remain unknown. “The upheavals didn’t really change anything, although many metalheads and the metal scene youth contributed to them. The government banned many concerts and we still struggle to change the status-quo,” explains Brood of Hatred’s Mohamed Milek regarding the benefits of the Spring on the national metal scene. “It is very hard to play metal in Tunisia. The metal scene is very small and underground, we never get coverage from media . . . Many accuse us of being Satanists, delinquent, immoral and violent. We are all alone in what we do, we don’t have the resources for bands to flourish. It’s really hard to find a place for rehearsals, and quite rare to find events where to play. Brood of Hatred, who play death metal that is equal parts brutal, technical and melodic, are one up-and-coming entity in Tunisia’s small yet comparatively accomplished metal scene. At the top of the pile are Myrath, who, in spite of the struggles faced by most of the region’s bands, have harnessed a prog formula with appeal extending far beyond their local Tunis, so much so, in fact, that their Tunisian – and Middle Eastern-tinged metal will be gracing this year’s Progpower festivals in Atlanta and Santiago. Other concurrent acts include the self-styled anti-Zionist gothic metallers Saracens, the Eastern-flavoured black metal of Out Body Experience, and the bone-crushing deathisms of Vielikan. 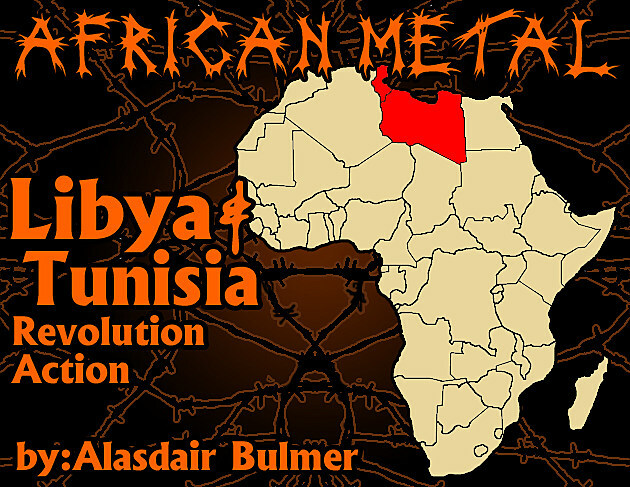 The emerging sub-genre of Berber metal is a regional phenomenon in itself (one which I’ll explore in greater depth in the upcoming Algerian scene report). Although Tunisia’s Berbers constitute an estimated one percent of the population, it is nonetheless a nation historically populated by Berber tribes prior the conquest of Arab Muslims between the 7th and 8th century AD. Enter Ayyur (Berber for ‘moon’), a mysterious black metal duo hailing from Sousse, co-appearing on the ‘Desert Storm of Evil’ compilation with Rex Mortifier. In true black metal fashion they declined to interview, but as purveyors of raw, necrotic BM with self-professed Berber thematics I’ll let the lo-fi screeches do the talking.